Two celebrated chefs are taking over the kitchen at The King & Co in Clapham for June 2017, with Fowl Mouths' Japanese comfort food serving from Tuesdays to Saturdays, and Eastern Bloc's Eastern European (& East London) classics serving on Sundays and Mondays. Great news for all of us, and both are a real treat to the tastebuds, and an extra dose of variety for the regulars! "This June, renowned Clapham craft beer pub The King & Co will host two of South London’s top popup chefs for its first residency double-header. 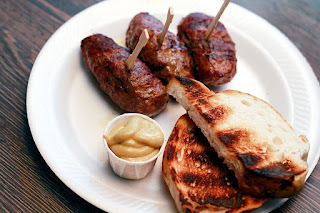 Launching on Monday 5th June, the new concurrent takeovers will see Eastern Bloc debut their unique Peckham-inspired Eastern European bites at the independent free-house each Sunday and Monday, then returning kitchen resident Fowl Mouths will bring back their much-loved Japanese comfort food every Tuesday to Saturday. Both chefs will also offer innovative brunch dishes during the daytime at weekends, plus daily specials and tempting desserts. Visitors to Fowl Mouths’ latest residency at The King & Co will be able to enjoy another sampling of founder Melissa’s signature delicacies like irresistible Teriyaki Chilli Wings and Kara-age Chicken with Wasabi Coleslaw, infamous from her initial sell-out successful supperclubs at home. Served five days per week throughout June, the new evening menu will also introduce the pub’s guests to popular dishes from her recent popups at South London hangouts including All Inn One in Forest Hill and NOAK in Brockley, such as Togarashi Crispy Squid and Sesame Miso Aubergine. Diners looking for a sweet ending to their meal can take their pick from Fowl Mouth’s delicate Cherry Sencha Panna Cotta with Cherry Sauce and Sesame Brittle, or indulgent Salted Caramel Brownie with Homemade Green Tea Ice-cream. For the second part of The King & Co’s dual residency, the venue will welcome Eastern Bloc to their kitchen for the first time. Inspired by Peckham's wild and ever-changing produce, founder Alex and the team infuse these ingredients into traditional Eastern European recipes with the aim of providing people an exciting taste of the unfamiliar. Promising a menu that’s all about grilling, charring and smoking, Eastern Bloc’s twice-weekly popup will showcase favourites from their previous packed-out sessions at Peckham hotspots like Peckham Springs and The Hope, ranging from mouthwatering Sticky Pork Belly with Blood Orange Giant Cous Cous Salad, to Polenta Fries with Crumbled Feta and Scotch Bonnet Mayo. Ideal for sharing with friends during the pub’s Monday night quiz, Eastern Bloc’s selection of bites will feature refreshing options such as Three Citrus Cod Ceviche with Sesame Cucumber Salsa and Fried Capers, plus a decadent dessert of Caramelised Popcorn Eton Mess with Star Anise Stewed Grapefruit and Lemon Curd. Those planning a leisurely weekend afternoon at The King & Co this June will be able to tuck into inventive twists on breakfast classics by the two kitchen residents. On Saturdays, Fowl Mouths will cook up an array of brunch items including Pork Belly Benedict with Yuzu Hollandaise, and potato korokke Croquettes and Eggs with Tonkatsu Sauce; then on Sundays Eastern Bloc will serve hangover-curing Halloumi Tacos with Harissa Scrambled Eggs and Sumac Red Onion, as well as original roast lunch specials. Alongside their acclaimed Bottomless Boozy Brunch, the pub now offers a super value Beery Brunch between 12 noon and 4pm on Saturdays, allowing craft beer lovers a bespoke choice of nine thirds from the bar’s extensive keg and cask beer collection to accompany their brunch meal for just £25 per person."